Our cat signs are purrr-fect! 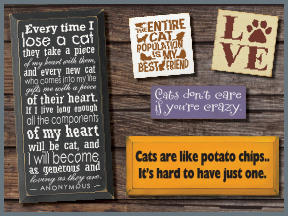 Cat lovers have a number of options when choosing one of our signs. Some are sweet signs, but most are funny cat signs! With over 40 colors to choose from, your solid wood sign from Sawdust City will look great anywhere! Cats Are Like Potato Chips. It's Hard To Have Just One! If kitty ain't happy, ain't nobody happy. The entire cat population is my best friend.